259-260 HARDESS ST LOUGHBOROUGH JCTN LONDON SE24 OHN. 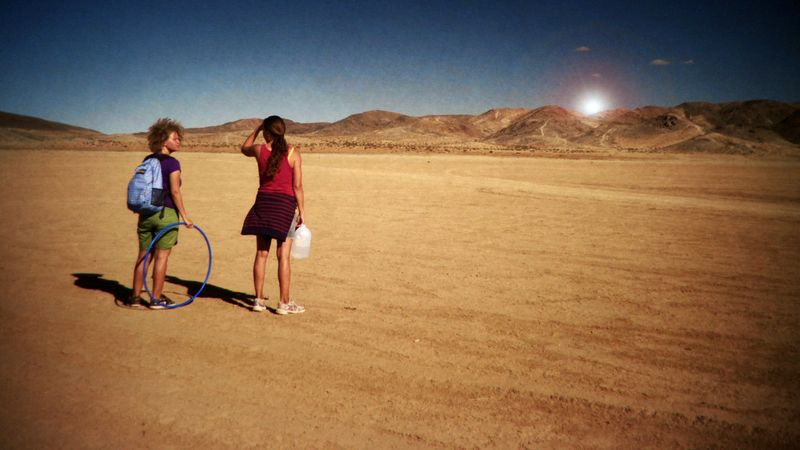 Night Sky is a 75 minute narrative film by Alison O’Daniel that enacts a sensory experience on the bodies of the viewers with live accompaniment and parallel, overlapping stories: two girls–Cleo and Jay–travel through the desert while a group of contestants compete in a dance marathon. This performance emphasizes music within the film by Ethan Frederick Greene, Lucky Dragons, and Evelyn Glennie with live musical accompaniment by *POLLYFIBRE* using adapted tools and objects amplified to create noise-scapes. Balloons will be provided for the Deaf audience spectrum. There will be a Q&A after the screening with Alison O’Daniel and Christine Ellison (POLLYFIBRE). Night Sky has received support through the California Community Foundation, the Puffin Foundation, the Creative Capacity Fund, and the Medici Foundation. The film premiered at the Anthology Film Archive in November of 2011 with two screenings as part of Performa 11 and the exhibition Walking Forward-Running Past at Art in General in NYC. The film has also screened in the Black Box Performance festival within Pacific Standard Time: Art in Los Angeles, at Evergreen College in Olympia, WA, Krowswork in Oakland, CA,and at the Fusebox Festival in Austin, TX. In September Night Sky will screen at USA Lounge, a defunct casino in Henderson, NV in conjunction with Pop Up Art House, the Guild Cinema in Albuquerque, NM, Plus Gallery’s Experimental Forum in Denver, CO, The Nightingale Cinema in Chicago, IL, the Cleveland Museum of Art, MOCA Detroit, the Visual Studies Workshop in Rochester, and at NYU.